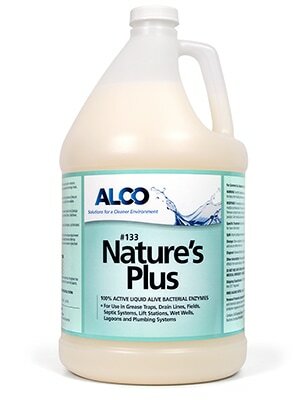 Alco Nature's Plus - Alco-Chem, Inc. Contains a blend of cultured bacteria, enzymes, detergent and deodorants. Designed to digest, liquefy and clean organic waste, paper, detergent, grease, hair, fat and other wastes to free drains, pipes and grease traps. It will restore normal biological activity to septic tanks and sewage treatment plants. Very effective odor control.